From LPs edited by Kenneth S. Goldstein. Cover designed by Gene Gogerty. New York 19. 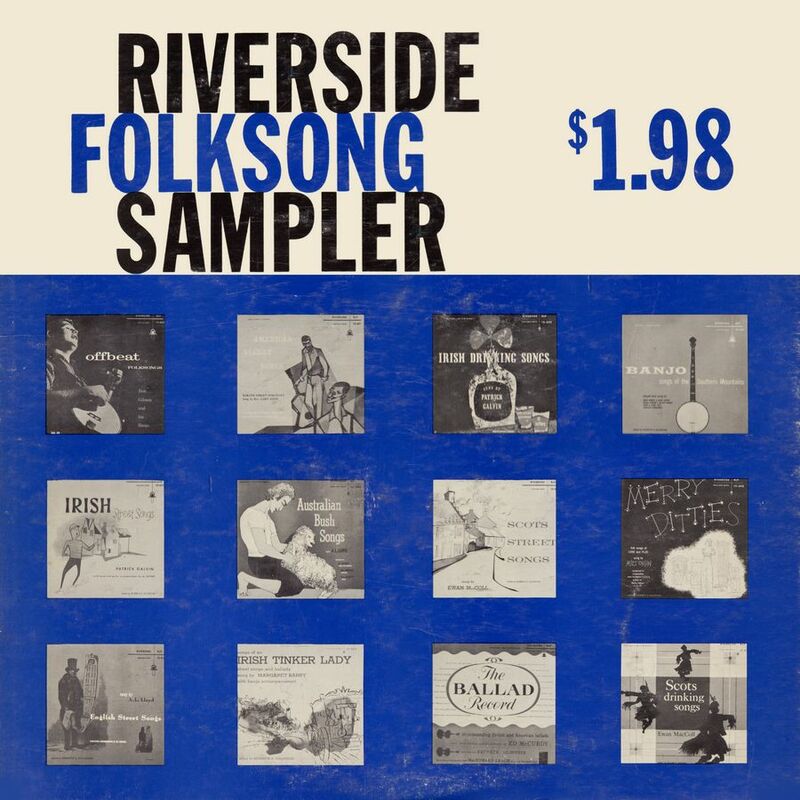 N. Y.
Riverside's newest series, the "Folklore Series" of highest-quality 12-inch albums, offers a brilliant combination of sparkling entertainment value and thoroughgoing scholarship. This special sampler LP, designed to demonstrate the broad range and appeal of this material, includes outstanding selections chosen from 20 of the more than thirty albums on the 1956 schedule. Included are remarkable examples of richly authentic Irish, Scots and English folksong, as well as recordings by such celebrated American performers as Jean Ritchie, Oscar Brand, Ed McCurdy, Bob Gibson. The entire series is under the direct editorial supervision of Kenneth S. Goldstein, an outstanding American folklorist who is uniquely experienced in. the recording of folk music. All LPs have full, authoritative notes, and many are accompanied by booklets giving complete texts. 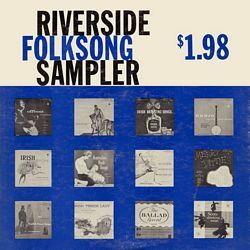 Although specially prepared to be available at an unusually low price, this sampler has been processed with full adherence to the same high standards and is pressed on the same finest-quality vinyl surfaces as are all $4.98 Riverside LPs. CHICKENS: From OFFBEAT FOLKSONGS (RLP 12-802), sung by Bob Gibson, accompanying himself on 5-string banjo. This college favorite is typical of the "offbeat" material Bob Gibson, an up-and-coming- star, performs before enthusiastic audiences in niteclubs, at concerts, and on radio and T.V. PEARL BRYAN: From BLOODY BALLADS (RLP 12-615), sung by Paul Clayton, accompanying himself on guitar. This overly detailed murder ballad concerns the decapitation of a young lady by her lover in 1896. It is typical of the gory American and British classic murder ballads sung in this appropriately titled album by an exciting young folklorist-folksinger. SHE MOVES THROUGH THE FAIR: From SONGS OF AN IRISH TINKER LADY (RLP 12-602), sung by Margaret Barry, accompanying herself on banjo. This beautiful love song is usually considered too delicate for street singing. However, Margaret Barry, an authentic Irish tinker and street singer, highlights the fragility of both lyrics and music as she sings this and other songs and ballads of Ireland. THE CALTON WEAVER: From SCOTS DRINKING SONGS (RLP 12-605), sung by Ewan MacColl, accompanied by Alf Edwards on concertina. Typical of the rousing nature of many Scots drinking songs, this high-spirited number is a product of the long-gone linen mills in the Calton district of Glasgow. MacColl is the leading Scottish folksinger and a frequent performer on BBC's radio and television programs on folkmusic. THE WABASH CANNONBALL: From THE GREAT AMERICAN BUM (RLP 12-619), sung by John Greenway, accompanying himself on guitar. Most people know this song as a hillbilly ballad, but long before it was known to Nashville and Tin Pan Alley it was a hobo classic of considerable standing. John Greenway is an outstanding collector, folklorist and singer of songs from the lesser known channels of folk material. A SUP OF GOOD WHISKEY: From IRISH DRINKING SONGS (RLP 12-604), sung by Patrick Galvin, accompanied by Al Jeffery on banjo and guitar. This 19th century tongue-tripper is sung to the-air of the popular jig tune The Irish Washerwoman, and extolls the virtues of the subject to its title. Galvin is a leading Irish folksinger, collector, author and poet. THE THREE RAVENS: From THE BALLAD RECORD (ALP 12-601), sung by Ed McCurdy, accompanying himself on guitar. This classic British ballad was first printed in 1611 but was probably known in tradition earlier than that. It is one of twenty ballads sung by McCurdy in an album intended as a musical supplement to MacEdward Leach's authoritative work, THE BALLAD BOOK, published by Harper and Bros. THE LIME JUICE TUB: From AUSTRALIAN BUSH SONGS (RLP 12-606), sung by A.L. Lloyd and accompanied by Al Jeffery on banjo and Harmonica, Alf Edwards on concertina and E. L. Rewald on guitar. A favorite shearing song in the woolsheds of New South Wales in the 1930s, this delightful song is typical of the many that A.L. Lloyd, one of Britain's leading folklorists, learned as a young sheep-herder and shearing-shed worker in the land down-under. LITTLE MAGGIE: From BANJO SONGS OF THE SOUTHERN MOUNTAINS (RLP 12-610). This delightful banjo lyric shares many stanzas in common with its more widely known cousin, Darling Cory. It is sung by Obray Ramsey, one of seven traditional-style folk performers who display their instrumental and vocal virtuosity on this superbly recorded album of field recordings made in the southern mountains. EARLY ONE MORNING: From MERRY DITTIES (RLP 12-603), sung by Milt Okun, accompanying himself on guitar. Early versions of this beautiful song appeared about 1828, and though the melody and first stanza are justifiably well known, the full text (sung here) hardly ever appears. Milt Okun has chosen these "folk songs of love and play" from Norman Cazden's book MERRY DITTIES, soon to be published by Abelard-Schuman. LITTLE BROWN JUG: From AMERICAN DRINKING SONGS (RLP 12-630), sung by Oscar Brand and Erik Darling, accompanying themselves on guitar and banjo. This widely known American drinking song probably traces back to the middle of the 19th century. Oscar Brand, whose folksong programs on WNYC and concert appearances have made him one of the nation's top folksong performers, collaborates with Erik Darling in a sparkling album of 17 rip-roaring drinking songs. SHADY GROVE: From SATURDAY NIGHT AND SUNDAY TOO (RLP 12-620), sung by Jean Ritchie, accompanying herself on dulcimer, and assisted by Roger Sprung on fiddle and banjo. A mountain lyric from the extensive repertoire of Jean Ritchie, the best known of the "Singing Ritchies of Kentucky." A traditional singer and dulcimer virtuoso, Jean Ritchie's books, recordings, and concert programs have made her known to ever-increasing audiences of folksong enthusiasts. I WENT UP ON THE MOUNTAIN: From SOUTHERN MOUNTAIN FOLKSONGS AND BALLADS (RLP 12-617). This is an American variant of an old English nonsense song. It is sung by Artus Moser, folksinger and collector from North Carolina, one of the seven singers and instrumentalists whose recordings in this alburn point up the still-living tradition of folksong found in the southern mountains. THE DARBY RAM: From ENGLISH DRINKING SONGS (RLP 12-618), sung by A.L. Lloyd and chorus, accompanied on banjo by Al Jeffery and on concertina by Alf Edwards. This is undoubtedly the greatest pack of lies ever celebrated in song, and traces back to ancient days when animals were worshipped on hill-tops. Lloyd has also recorded for Riverside an outstanding album of ENGLISH STREET SONGS (RLP 12-614). LORD RANDALL: From THE ENGLISH AND SCOTTISH POPULAR BALLADS (RLP 12-621 through 629). This classic Scots ballad, sung by Ewan MacColl, is one of 82 ballads from the collection of Francis James Child, issued by Riverside in the most important academic recording project ever undertaken. All 82 ballads are sung unaccompanied, and Ewen MacColl and A.L. Lloyd, who share the singing between them, sing over 5 1/2 hours of the greatest traditional ballads in the English language. FOOTBALL CRAZY: From IRISH HUMOR SONGS (RLP 12-616), sung by Patrick Galvin, with banjo and guitar accompaniments by Al Jeffery. This street ditty is as well known in Scotland as in Ireland, the Irish version being somewhat more detailed and more humorous. Galvin has also recorded for Riverside IRISH LOVE SONGS (RLP 12-608) and IRISH STREET SONGS (RLP 12-613). THE OLD CHISHOLM TRAIL: From the album of the same title (RLP 12-631), sung by Merrick Jarrett accompanying himself on guitar. The most widely known and typical of all cowboy songs. Jarrett, a citizen of Canada, has specialized in studying and singing cowboy songs and prepared this album in conjunction with a fourteen week radio series on cowboy songs which he broadcast over CBC early in 1956. HARD TIMES IN THE MILL: From AMERICAN INDUSTRIAL FOLKSONGS (RLP 12-607), sung by John Greenway accompanying himself on guitar. This alburn contains songs of miners, textile workers, farmers and other industrial groups. John Greenway is a professor of English and author of the book, AMERICAN FOLKSONGS OF PROTEST. He is also the recipient of a Fulbright Award to study the industrial songs of Australia. TO THE BEGGING I WILL GO: From SCOTS STREET SONGS (RLP 12-612), sung by Ewan MacColl with occasional concertina accompaniment by Alf Edwards. This song is a British counterpart of the American hobo ballad The Big Rock Candy Mountain in picturing the tramp's life as being wonderfully free and desirable. MacColl has also recorded an album of SCOTS FOLK SONGS (RLP 12-609) for the Riverside folklore series, in addition to his SCOTS DRINKING SONGS album and his work in the Child ballad albums. BLOW GABRIEL: From AMERICAN STREET SONGS (RLP 12-611). This holy blues is one of the eight Harlem street spirituals sung by the Reverend Gary Davis in this unusual album of religious and secular street songs. The latter are performed by a Carolina street balladeer, Pink Anderson. Both singers display amazing virtuosity in their guitar accompaniments.